Biossance is a company that is pioneering sustainable beauty through biotechnology. The company started in 2003 to develop a patented technology that offered a cure for malaria, and they've been expanding ever since. Biossance continued using their innovative biotechnology to improve the world of skincare, offering products with healthier, sustainable ingredients that deliver impressive results. Biossance products are effective and safe, but best of all? They do not harm animals or the environment. 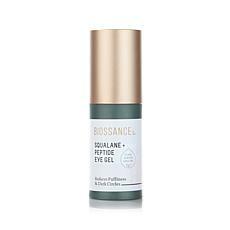 The most popular product from the Biossance line is Biossance oil, which contains squalane (C30H62). Your body produces this powerful, moisturizing molecule naturally, but as you age, your natural production levels drop drastically. Without enough squalane, your skin feels dry and rough. Squalane also protects your skin from harsh pollutants and exposure, so when you don’t have enough of this in your body, your skin becomes more vulnerable. In the past, skincare companies harvested squalane from shark livers, which had a detrimental impact on the environment — Biossance oil uses a plant-based, eco-friendly alternative that delivers the same results. Shop the impressive line of Biossance products at HSN, where you can find pure squalane oil, along with eye gel, cleansing oil, moisturizer, and oil mixed with vitamin C and rose hips for improved, long-lasting results and better looking skin.